I'm pleased to show you the first of my "Christmas in July 2010" projects. This table runner was inspired by the Sugar Cookie table runner that can be found on the Moda Website. I got carried away and added too many hexagons, so in order to make this fit my dining room table, I squared off the ends. 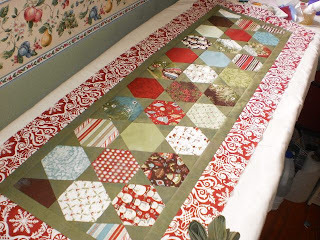 I used a Moda "Fruitcake" charm pack and some coordinating green and red Moda fabrics for the two borders. This runner is not quilted yet but I hope to machine quilt it in a couple of weeks. I thoroughly enjoyed using my mid-size (2" side) Quilt Sense Hexagon for this runner and definitely will use this hexagon template set again. The binding is all made so this should be a pretty quick finish. I LOVE this!!! Do you do shows where you sell your creations? I'd be first in line to buy EVERYTHING!!! Love it, and the colors are beautiful.